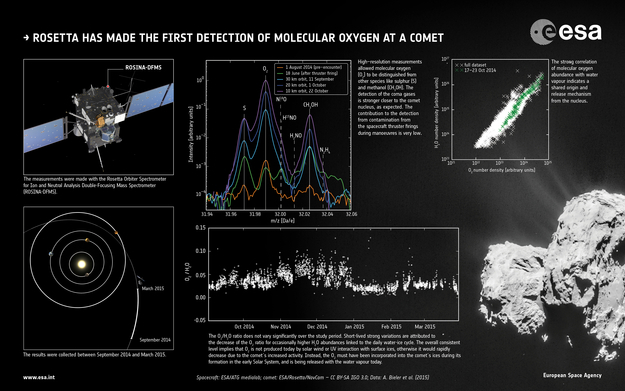 ESA's Rosetta spacecraft has made the first in situ detection of oxygen molecules (O2) outgassing from a comet. This surprising observation suggests they were incorporated into the comet during its formation. This infographic depicts various strands of evidence gathered for the study. More than 3000 samples, collected around the comet between September 2014 and March 2015, were analysed to identify the O2. High-resolution measurements allowed the team to distinguish O2 from other species such as sulphur and methanol. The amount of molecular oxygen detected showed a strong relationship to the amount of water measured at any given time, suggesting that their origin on the nucleus and release mechanism are linked.